Konrad Erlinger published problems under the pseudonym of Konrad Erlin. He was a prolific composer, a lover of model mates and of sacrifices of white pieces, and a precursor of the Bohemian school. Three of the four white pieces get to sacrifice themselves. 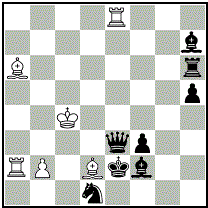 The white Rook is sacrificed actively in two variations and passively in the third. Rich play of the B-R battery in Meredith. Like Erlinger, Taale too used a pseudonym (J. de Jutter) and composed direct mates, heterodox or fairy problems. 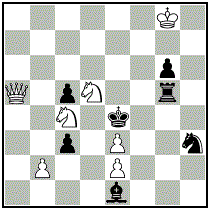 Task: on 10 different moves by the black Rook, there are 10 different mating moves. The key unpins both a white piece and a black piece. Black interferes the unpinned unit, which allows the mates (thenatical variations in bold). You can find some of his games here. Sammelius is a great artist and it was hard to make a selection. According to Echesspedia.com [broken link] one hundred of his compositions have been published in 1988 in a book "Probleem componisten XII". The key offers a fourfold interference, which is exploited in the mates. Two corrections of the 1st degree by the black S (1...Sd7 against 3.c4# and 1...Sf3 against 3.Rd2#). Siers battery with a rare block key. Karpov composed in all genres. A beautiful problem based on selfpins and unpins. Mates are given by the Royal battery as a response to Leibovici-Pelle interferences.